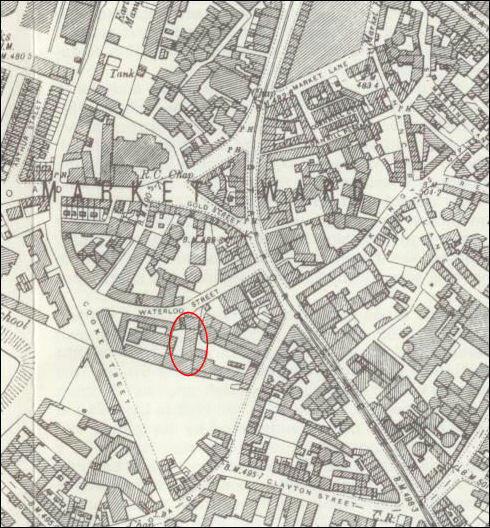 At one time Lane End and Longton were two seperate areas of what from 1865 was just called Longton (see links at the bottom of the page). There have been some street name changes over the years and Flint Street became Waterloo Street around the 1850's and 100 years later in the mid 1950's it was renamed Barford Street. 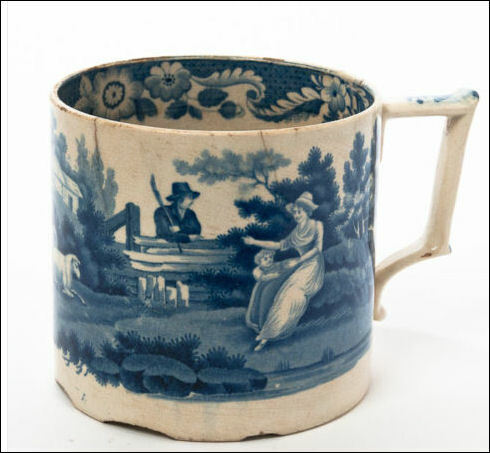 Waterloo pottery had a number of pottery companies working from it during its 150 year life - the exact dates of operation are not always clear. 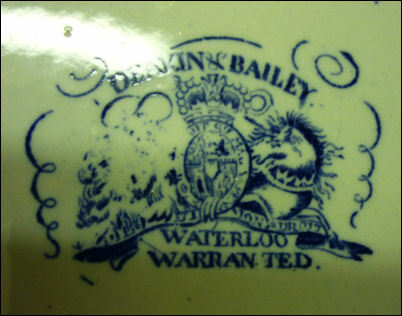 The Waterloo Pottery in Flint Street, off Stafford Street, was opened in 1815 by Batkin and Deakin who were still working there in 1822. 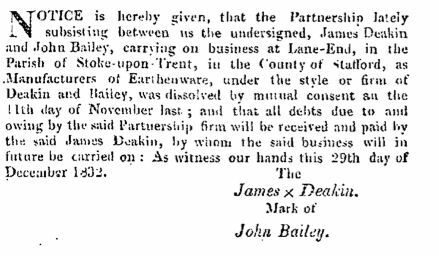 It was worked by Deakin and Bailey from 1828 to 1830 - in 1832 their partnership was disolved - and then from 1833 to at least 1862 it was continued by James Deakin and variously known as Deakin & Son, James Deakin & Son and James Deakin & Co. 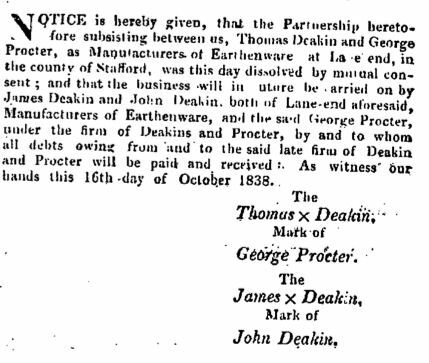 The '& Co' included a George Procter - see the London Gazette entry below. 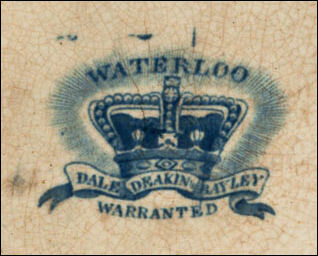 At some time at the Waterloo Pottery there was a partnership named Dale, Deakin & Bayley as evidenced by the blue and white mug shown below. 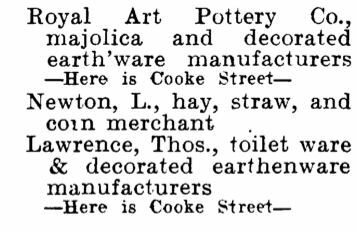 Between at least 1864 and 1869 the works were operated by Lowe and Abberley and in the early 1870's first by James Abberley and then from 1872 by Brough and Blackhurst, makers of earthenware, who were still there in 1899. 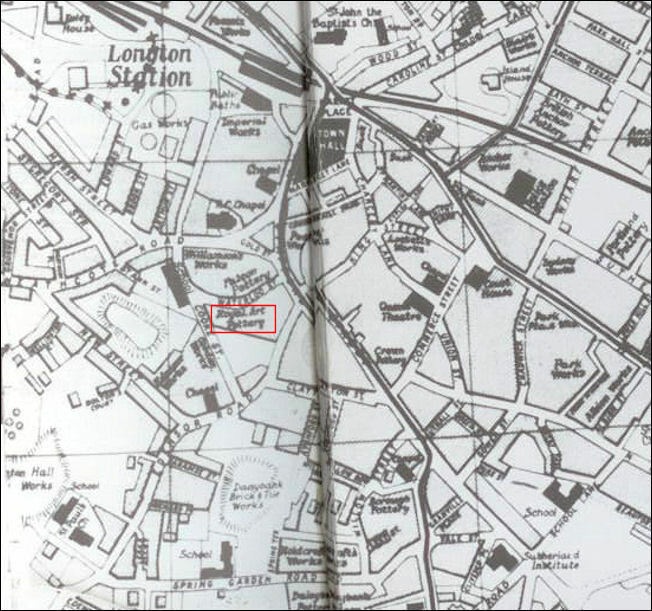 The works became named as the Royal Art Pottery (see 1907 map above) and was operated by Alfred Clough Ltd. from at least 1940 to the mid 1960's. Salisbury Crown China Works, the St. Louis Works and Beswicks. See the use of the Royal Arms on pottery. 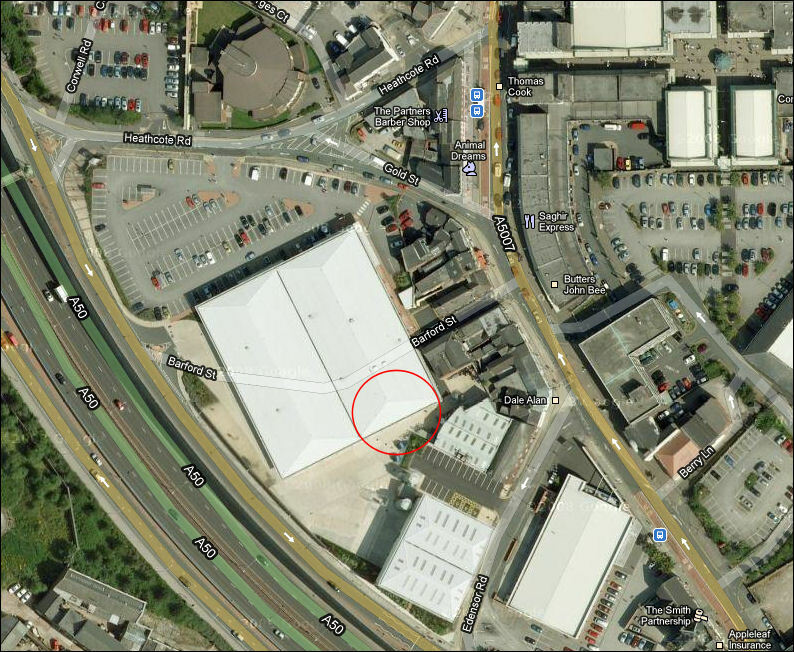 Lane End and Longton - Confusion often arises over the location and names of Lane End and Longton. Originally they were two separate and contiguous townships which were incorporated in the of Borough of Longton in 1865.